I have a love/hate relationship with Google. I really do get how the link spam problem has drastically plagued the search results, so I respect and understand a lot of things they’ve done to combat it. But at the same time, there’s been confusion, lack of information and lots of contradictory advice over the years. Much of this has caused incredible amounts of paranoia among site owners. Fortunately things have gotten better and they’ve gone from no warning/communication at all to providing a “Manual Actions” section in Google Webmaster Tools so you can keep abreast of any site warnings or penalties. A lot of people don’t know this, but Google manually reviews websites from time to time. There is a team that is dedicated to this task. In fact, I received a warning from a manual review back in 2012 when Google sent out their very first round of Google Webmaster Tool warnings during an effort to become more transparent. The manual action didn’t seem to have much impact on traffic, but I suppose it could have if I would have ignored it. It was the most frustrating thing because I had no idea what caused the warning. Well, after a couple of months I got the “Manual Action” removed, and since then I’ve helped a handful of other readers get theirs removed as well. The trick is HOW you respond to the action via the reconsideration request. NOTE: This advice is only if you receive a Manual Action in your Google Webmaster Tools account. If you submit a reconsideration request for a drop in traffic from a routine algorithm update, it will be ignored by Google. I totaly agree with this article! You’ve pointed very well this problem that is ignored by a lot o people but for Google has importance! From time to time, in specially when you’ve observed massive changes on your traffic you should verify this aspect and try to solve the problems! making good links and great content will help to avoid manual action. but these days i am losing my ranking for the keywords, they were somewhere around 20 and suddenly slipped to 40, so what is the reason behind this and some of other keywords are ranking well there is no change in them. i am banging myself over this, could you please enlighten me. Google does take manual action, i had been to this manual action last year and after great hard work of 3 months they removed manual action from my website. Yes I agree How you respond to the action via reconsideration request is the first and main step. The best way to save your site from such google manual action is try to work ethically try to make genuine backlinks avoid spamming. Thank you lisa selecting this topic for podcast. I was so unfortunate to purchase an expiring domain and found out its under the manual action from Google. I have emailed them about it and I have yet to get a reply officially. Their instruction on the Google Site was to remove the spammy links done by the previous owner but when I checked on those backlinks, the sites are not even valid. I think every time Google updates their algorithm, something will unpredictable will really happen, just build your links ethically and Google will never touch your site. Google penalized my site because I had a photo upload site and the layout was same even though the images were not …. I had to shut it down any suggestion to prevent it again? Hi, there, recently I have noticed traffic coming to my site from some strange link that looks like this: http:// and nothing else after it. Should I disavow that link cause it get me penalized? Thank you in advance. That seems like some kind of error or bot activity. I wouldn’t worry about that. Dear like if there is no warning from years in manual action of webmasters.Does it means that the web is in good condition and it what cases this problem occurs? Yes, if you have no warnings then you have no manual action on your account. I’m not sure what you mean by your last question? Hi lisa i am a adsense publisher and 90% of my traffic comes from Facebook ads and in my Facebook fan page. I read some blog post today that says adsense considers traffic from facebook as invalid and my account possibly get banned. Is that true? That is not true at all. Do you have a link to the article? First of all, you can’t control where people visit your site from so Google wouldn’t ban a publisher just because of that. There has to be more to the story. I’d love to see that article. Grrrr…. clicked on the post comment button by accident…. In addition, I also noticed that each primary post appears to be getting longer almost as if you combined information from previous posts. Again, is panda forcing us to provide the readership with longer more informative content in order to get the lions share of the Serps? Thanks again, and thanks for the previous link to myhandymanpage.com website. Yes I’ve been experimenting with a more focused, less cluttered and mobile-friendly homepage. I’m not 100% happy with it yet but one thing is for sure….my bounce rate has improved. As you can see, I’ve changed it again and added more color. I’m experimenting and doing a lot of testing right now. My ranking has more to do with the age of my site and many links that I’ve earned over the years. It’s just too much of a pain to convert everything over and I don’t want to risk losing key rankings. They used to treat them differently, now it’s the same. Honestly, I wish I had never created the sub domain at all and installed WP on my main domain and just added a category called “BLOG”. But I wasn’t thinking ahead and strategically back then. So now I have to clumsily manage two sites and make them look like one, when one is really not a WordPress site. It would be a pain to merge everything now. That’s true. Google has a team which also takes part manually in the Ranking process. Brian, I’m glad you pointed that out because I did forget that Google made that change some time ago. As you can see from the article, that hasn’t always been the case and was not the case when I received my notice. Thanks again for pointing that out! Thanks for the informative podcast Lisa! I have also been linking together related sites, not to pass pagerank, but because they were related to one another. Perhaps I should no follow these. But, like John said, I do get tired of Google and their penalty threats. It wasn’t all that long ago when Google actually told us to link to related sites and even to submit our sites to directories. Now when we follow that advice we are penalized. I like your advice about getting other traffic sources, but it is hard to create such a list if there isn’t much traffic from the search engines to begin with. People have to be able to find your site to subscribe to your list. I listened with interest when you said you were linking your blog and your site together and thought it was safe to do so because they’re related. The first thing that struck me was that Google perceives this as a PBN or private blog network where links are used to flow page rank. I’m working on a few sites that are closely related but I’m careful about how I link sites together. The No follow attribute gets used on links, and I’ve also stopped using site wide followed footer links. Web designers in particular use back links in the footer of client websites as a means to get “build links” which means they can fall foul of any site wide followed footer link penalties. In fact, there is a conditional PHP statement for displaying footer links only on the homepage of a WordPress site. It is also useful to know how you responded to the Google penalty notice in WMT. I can imagine how upset you were to discover that notification. I’ll remember not to swear if I get bitten by one of these Google animals, and maybe then the member of the spam team will be more cooperative. Keep it clean, keep ’em keen! I think Google has done more harm than good to many good websites. It seems to me Google thinks it owns the web and what it says goes. And for many, that seems to be the case. 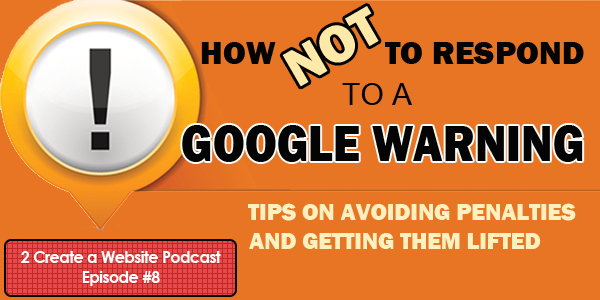 Since Google seems to change rules for the game in mid-stream on a regular basis, no one can keep up with all the nonsense and chaos they’ve created on the web for many small web site owners. What works today on SEO and conforming to their other wishes may not be the case tomorrow. We’ve seen this happen time and again. So where and when does it stop? Never, if Google has anything to say about it. Personally, I think folks ought to just find other mechanisms to drive traffic to their sites and NOT rely on what Google thinks. Lisa has provided many useful blog postings on how to accomplish this. And, there seems to be way too much emphasis on page ranking anyway since it has little to do with actual traffic. It is clear Google’s intends to control search engine traffic on the web. They cater to those who can pay for placement on the first page of search results. Most of us who are small site owners do not experience that luxury of having deep pockets to pay for that placement. This may sound as heresy to some, but I think Google needs to be ignored for the most part and people just do their own thing by writing good original content, using long tail keywords for those less competitive phrases and look at other outlets like Pinterest, Instagram, Facebook, Twitter, etc to drive traffic to our sites. Of course, I’m sure there are some down sides to what I think what should and shouldn’t be done. But, I’m a little worn out playing the Google game where rules change change on a daily basis. Keeping up with all the rule changes is like changing underwear on a daily basis. If you don’t do it, it begins to stink after awhile. John, I understand your frustration. Google demolished my traffic without any warning. My site used to get over a 60,000 hits a month. Now it gets less than 10,000. And rank does matter for traffic. Moreover, people don’t pay Google to get a listing on the first page. Not for organic search, anyway. As for Facebook, it’s becoming more and more unreliable as a source to drive traffic to your website. If things don’t change, I won’t be surprised if there comes a point when they end up like Myspace. As for Google Search, it has gone to the wayside, in my opinion. There is a website I know of ranking for the same keyword phrase in 5 spots on the first page (in a row). That doesn’t sound like quality search to me, but a monopoly. And Google lets this happen while punishing others. Bottom line: The system isn’t fair, and most likely never will be. We just have to deal with it. Build an email list. That seems to be the best option at this point. But that, unfortunately, can get expensive. Well said, Chris. My biggest regret is ignoring that email list tip years and years ago. I treat all Google traffic now as a bonus. John, I agree. I believe Facebook could end up like MySpace. History repeats itself. However, FB experts like Jon Loomer will tell you you’re wrong and that you just need to adjust your paid traffic strategies. As for Google, I’ll take any organic traffic they give me, and that is why I’ll do my best to optimise my site. I’m more interested in trying not to bring any unneccessary heat on myself rather than pursuing search engine glory. What do you mean by building a list can get expensive? It was my understanding that even though your rates would go up the more subscribers you had, you would also (potentially) be making more money because of how big your list was. I’m in the early stages of my website and my list is something I’m going to start working on pretty soon here. Exactly Eddie. If your list is costing you then you’re doing something wrong. The idea is the larger your list, the more you “should” be making. So even though your fees increase you should be able to cover the cost. John, I think many people share your feelings and frustrations. We are in a new era now and as you said, you just have to focus on other ways of drawing traffic and let the Google chips fall where they may. No but seriously, I hear what you’re saying. I won’t ever completely ignore Google because I do value what traffic I do get, but I don’t obsess over every little thing like I used to. I follow the rules that make sense and are logical and let the chips fall where they may. Someone asked me if they should nofollow all links on their site for fear of a penalty. To me, that’s going overboard and that’s the paranoia that I’m talking about. I understand certain guidelines but obsessing over every little move will make you nuts. And as you said, things will probably change. John, There is no doubt that Google has problems with serps. However, in consideration of your complaint about how making it to the front page or lack there of has affected many webmaster’s efforts, let’s look at the numbers for a moment. Take for instance Lisa’s front page. She currently ranks number 1 on Google’s organic listings… That’s number 1 out of 1.85 Billion pages…. Now I know that Lisa is not General Electric or BofA with unlimited funds to have dozens of SEO Experts working to gain the upper edge. So my statement is it can be done. I would venture to say that if you spent as much time tweaking your own site, educating yourself on SEM, SEO, and Marketing in general as Lisa does, you too could rank number 1 in time. Ain’t nobody with half a brain in this business thinks it can be done overnight. Lisa has been at this for several years now. She has hundreds if not thousands of pages indexed. She has multiple websites, and she’s the Queen of Video as far as i can tell. She gets thousands of hits from her videos alone. It goes to show that in Lisa’s case, perseverance pays off. And to Chris, I know that having had 60,000 hits per month down to 10,000 per month is tough to swallow. But from my perspective working on several new sites at the moment, I find 10,000 visits (I am assuming you mean visits as hits are a different factor altogether) to be a pretty damn good figure these days. As Lisa eluded to in one comments where she says she wishes she had paid more attention to email lists earlier on is damn good advice. I’ve been building a website called http://www.MyHandymanpage.com where I am offering free contractor listings with do follow links and have yet to get a single listing for over 2 weeks. Is it a blow to my ego after building websites since 1998 to find myself in the dungeon? You bet it is. But I understand that it takes time. You have to pay your dues like the rest of us. So be happy with 10,000 Visits. However, complaining about it wont build readership, hard work, testing, constant maintenance, and patience is key. As far as I am concerned, Google pretty much owns 70% of the web at the moment on the search engine side, and it’s primary reason for being is to make money for it’s investors. I cant blame them for manipulating the serps to benefit their revenue intake. I don’t have lik. e it, but I do have to work within their params. How about you outline how you got 10,000 visitors in detail? I doubt you would, nor should. It’s your business, and you are free to build it, tear it down, or just let it sit as you wish. Hi Lisa, that was a wonderful podcast..I read the transcript though. Though I haven’t received any manual action and my humble blog is too small to be visible to the team I enjoyed this informational podcast. Thanks and have a great week ahead.